Visit StopPATH WV Blog for the Latest Transmission Rants! Washington, D.C., January 23, 2017 – Electric customers in 13 states will soon be receiving more than $7M in transmission credits on their bills thanks to the efforts of two women from West Virginia who have spent the past 6 years pleading their case to regulators in Washington, D.C.
Last week, the Federal Energy Regulatory Commission (FERC) ordered the failed Potomac-Appalachian Transmission Highline (PATH) project to refund more than $7M it had incorrectly recovered from electric ratepayers for an advertising, lobbying, and advocacy program designed to persuade state regulators to approve its project. FERC affirmed an earlier ruling by one of its Administrative Law Judges that the company had made an accounting mistake when it added the costs of its advocacy program to consumer rates. The Commission ruled that $2.6M in advertising costs, and more than $3M spent on advocacy groups supporting the project, were not accounted for properly. FERC’s Opinion No. 554, released during a FERC meeting on January 19, also ordered refund of several hundred thousand dollars of PATH’s costs to lobby government officials for approval of the project. Keryn Newman of Shepherdstown, and Alison Haverty of Chloe, started back in 2010 what would become a 6-year odyssey, ultimately taking them to the nation’s capital for a 15-day administrative hearing. The women wanted to find out who was paying for PATH’s extravagant advertising campaign, and who was behind the numerous groups supporting the project that had suddenly sprung up. Although neither one had any legal training, they investigated and took advantage of existing regulatory processes to satisfy their curiosity. What they found was a stunning paper trail documenting paid advocacy and lobbying intended to drown out grassroots opposition to the project. The real problem, however, turned out to be that electric ratepayers in the 13-state PJM Interconnection electric region had paid for the company’s scheme. Newman and Haverty initially tried to work with the company to resolve the issues, but in January 2011 ended up filing formal legal complaints with FERC, who regulates interstate electric transmission rates. Over the next six years, the women filed dozens of legal pleadings and attended numerous conferences at FERC headquarters in Washington. In the spring of 2015, the matter was finally heard by FERC Judge Phillip Baten, where the women represented themselves by filing testimony, introducing exhibits, cross-examining PATH’s witnesses and filing numerous post-hearing briefs. Their hard work paid off when the Judge issued his decision in September of that year, finding that all costs challenged properly belonged in an account that is not recoverable through the rates PATH charged to consumers. Last week, FERC’s appointed Commissioners affirmed the Judge’s ruling and ordered a refund. “The powerful energy companies were using our money to sell us and convince us we needed their project. Anyone who learned this was happening said the words, ‘That's not right.’ It's not every day I get to show my kids that when we stand for what is right, we can win. It was a good day!” said Alison Haverty, a mother of four and first-grade teacher in Clay, W.Va.
“There comes a time when you need to put down your protest sign, put on your business suit, and go inside,” said Newman, a former accountant. “It was an enormous commitment of time and resources, but I wouldn’t change a thing,” she added. BACKGROUND: The PATH transmission project was a 275-mile high voltage electric transmission line proposed in 2007 that was slated to run from St. Albans, West Virginia, to a new substation in Mt. Airy, Maryland. The project drew fierce opposition from citizens all along its route and was eventually cancelled by regional grid planner PJM Interconnection in 2012 when a reevaluation determined there was no need for the project. "On August 24, 2012 the PJM Board of Managers met to consider the PJM staff recommendation to remove the MAPP and PATH projects from the Regional Transmission Expansion Plan (RTEP). PJM staff reviewed results of analyses showing reliability drivers no longer exist for the project throughout the 15-year planning cycle. The analyses incorporated the continued trends of decreasing customer load growth, increasing participation in demand response programs and the recent commitment of new generating capacity in eastern PJM. The PJM Board of Managers considered the communication received from stakeholders, and results of the reliability analyses completed by staff and decided to terminate the MAPP and PATH projects and remove them from the RTEP effective immediately." Come do the victory dance with us over on the blog! The recently terminated Potomac-Appalachian Transmission Highline project is now facing another legal battle, this time over who will pay for a portion of the failed project. On September 20, the Federal Energy Regulatory Commission issued an order granting formal challenges to PATH’s rates totaling $5.7M and setting the matter for hearing. The challenges, filed in January and December of 2011 by two West Virginia electric consumers, Keryn Newman of Shepherdstown and Alison Haverty of Chloe, were found by the Commission to raise serious doubt regarding the prudence and accuracy of PATH’s expenditures in 2009 and 2010. Newman and Haverty challenged PATH’s recovery of lobbying, advertising, public relations advocacy, membership and donation expenses, as well as the accuracy of PATH’s calculation of rates, including instances where the company recovered more than it paid for services. In its order, FERC also upheld consumers’ right to examine and challenge transmission rates that are passed to them in their electric bills. PATH had argued that end-user customers do not have standing to examine and challenge rates. FERC’s order determined that any electric customer who pays some portion of a transmission rate has standing under section 206 of the Federal Power Act to examine and challenge that rate. In keeping with usual practice, FERC ordered PATH and the two consumers to attempt a negotiated settlement before the matter proceeds to hearing. FERC’s Order may be viewed here. PJM staff recommends PATH Project be cancelled! Grassroots activism has triumphed over corporate propaganda! On August 9, 2012, grid manager PJM Interconnection staff will recommended to the PJM Board of Managers that the PATH Project be cancelled. The Board of Managers is expected to meet and make the final decision on the project's fate on August 24. We will publish news as it happens. Meanwhile, keep up-to-date on energy policy news by reading our StopPATH WV Blog. Work has recently begun in Jefferson County on the rebuild of the Mt. Storm-Doubs 500kV transmission line. This is NOT the PATH Project! In 2010, Dominion Power proposed the rebuilding of their transmission line that runs through Summit Point, south of Charles Town, Millville, and up over the mountain into Virginia. The proposed PATH Project would have paralleled this existing line, but the two projects are not related. Dominion needed to rebuild their transmission line because the towers were deteriorating to the point that they were in danger of collapse, and a rebuilt line will increase the thermal capacity of the line by 66%. The increased capacity of a rebuilt Mt. Storm-Doubs was a factor in the suspension of the PATH Project. In early 2011, Dominion personnel made a promise to StopPATH WV leadership that they would treat landowners affected by the rebuild with fairness and respect. Some feel that Dominion is not living up to their promise. StopPATH WV will continue to monitor Dominion's progress and provide information. If you need more information, feel free to email us. The organization that originally approved a 765-kV transmission line to carry “coal by wire” across three states will be voting in two weeks whether to kill the project for good. The Transmission Expansion Advisory Committee (TEAC), tasked by regional transmission grid operator PJM Interconnection with prioritizing prospective transmission projects, today will make a recommendation to the PJM Board of Managers that the Potomac-Appalachian Transmission Highline (PATH) be dropped from the TEAC list and canceled. The board will consider the recommendation to kill PATH at its Aug. 24, 2012 meeting. “Our mission was validated when we learned today, Aug. 8, 2012, that PJM has decided the PATH transmission line is no longer needed, and they will recommend to the board that the project be canceled outright,” said Robin Huyett Thomas, president of StopPATH WV, a Jefferson County citizens’ group. The $2.1 billion PATH transmission line was planned in 2007 to deliver electricity from a coal-fired generation plant to east coast load centers. The 275 mile-long project was to run from the John Amos plant in St. Albans, WV, to a new 42-acre substation in Frederick County, Md., passing through West Virginia and Virginia on the way. After more than four years and multiple hearings in three states, the project was suspended in 2011 by PJM after opponents demonstrated it was not needed, and the Virginia State Corporation Commission ordered PJM to perform an updated need analysis. Though the utility companies then withdrew their applications before state regulatory agencies, the project has continued to charge project expenses, including a 12.4 percent return on equity (ROE), to all 60 million PJM ratepayers in its 13-state region. StopPATH WV, Inc. was formed in 2009 to protect the interests of Jefferson County, W. Va., citizens and landowners. The organization used more than $50,000 in donations for attorneys and experts to oppose the project at the West Virginia Public Service Commission before the application was withdrawn. “We thank all those who, from the first state filing for this project in 2009, stood up and voiced their opposition, asking our politicians, federal and state agencies, and the energy generation, distribution, and transmission fields to look to the future, rather than build for the past,” Huyett Thomas said. Keryn Newman, a StopPATH WV member from Shepherdstown, has been tracking PATH expenses being billed to ratepayers. By the end of 2012, Newman estimates, PATH will have collected over $95 million in annual revenue requirements from PJM ratepayers since PATH was awarded the 12.4 percent “incentive” ROE authorized by the Federal Energy Regulatory Commission in 2008. FERC also granted PATH an incentive that allows it to apply to recover an additional $130 million in capital investments for the project, with the prospect of additional ROE billed to ratepayers, in the event that it is abandoned and not built. PATH must convince the Commission that it had no fault in the abandonment and that all expenditures were prudently incurred. “The PATH project could end up costing electric consumers nearly a quarter of a billion dollars by the time it’s all said and done, when you add interest and carrying costs over perhaps four decades. The consumers, however, will see absolutely no benefit from the money they have spent,” said Newman. Both Newman and Alison Haverty, of Calhoun Co., W. Va., have filed formal complaints with FERC alleging that PATH has billed ratepayers at least $5.8 million in imprudent expenses. The complaints seek a refund, plus interest. Newman said they would be monitoring abandonment expenses PATH seeks to be repaid by ratepayers. The PATH project, along with the Trans Allegheny Interstate Line (TrAIL) completed in 2011, was integral to “Project Mountaineer,” a 2005 PJM initiative focused on building transmission to carry coal by wire from Western to Eastern PJM, claimed by PJM to be “needed” on the East Coast. StopPATH WV, along with other opponents of the project, has always maintained that PATH was not needed. PJM staff’s recommendations echoed opponents’ arguments that decreased electricity demand, improved peak-use demand management, and new generation planned for the East Coast eliminated arguments for PATH’s construction. The PATH Project has been "suspended" by regional grid planner PJM Interconnection, however electric consumers in 13 states continue to be charged for the project's continuing expenses! Two West Virginia citizens have filed a new complaint with the Federal Energy Regulatory Commission (FERC), alleging that the PATH Transmission Company subsidiaries of FirstEnergy (formerly Allegheny Energy) and American Electric Power have continued to improperly charge millions of dollars in promotional expenditures to ratepayers in 13 states and the District of Columbia. With this complaint, PATH’s overcharges total nearly $5.8 million over the past two years, when combined with the first complaint filed in January 2011. Keryn Newman, a Shepherdstown resident, and Alison Haverty, of Chloe, filed their second Formal Challenge to the Potomac-Appalachian Transmission Highline, LLC 2010 Annual Transmission Revenue Requirement, on December 23 with FERC. Their review of 2010 project costs reveals a propaganda pattern, using funds inappropriately recovered from ratepayers, to influence state regulators, as well as a large number of simple accounting errors. The complaint asks that FERC reject PATH’s Annual Update filing and begin a broader investigation of more overcharges by the power companies. “We contend that the Commission never intended to hand PATH a blank check signed by electric ratepayers in 13 states to use as they see fit to promote their for-profit endeavor,” said Newman. 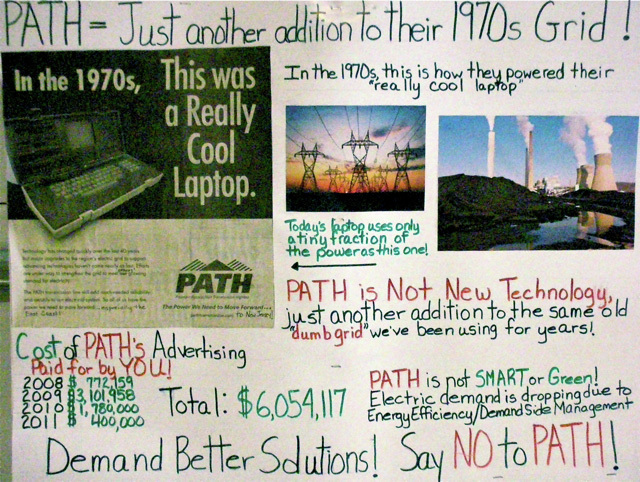 The PATH Companies recovered expenses of nearly $1 million for an advertising campaign utilizing recognized propaganda techniques and more than $1 million to create and manage fraudulent “grassroots” groups and an advocacy program carried out with private groups and inappropriately billed as “public education.” The recovery of these costs from electric ratepayers violates FERC regulations. Bill Howley, of The Power Line blog, has been covering PATH for the last three years. “The fact that ratepayers in PJM Interconnection are being charged for a dead PATH project is bad enough. The PATH companies should not be allowed to get away with sloppy accounting and dishonest representation of their promotional costs as 'public education,'” Howley said. 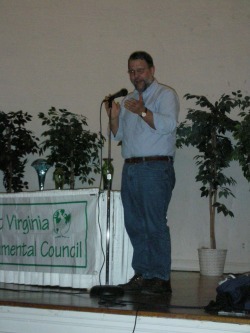 The citizen complainants discovered improperly recovered expenses related to lobbying by West Virginia Democratic Party Chairman Larry Puccio, and attempts to exert influence on the Loudoun County, Va., Board of Supervisors to release a conservation easement along PATH’s proposed route – by creating a more destructive route around the easement and pitting neighbor against neighbor. Also detailed in the complaint are efforts by PATH lobbyists to interfere in the Maryland Public Service Commission’s consideration of PATH’s application through the intervention of the Maryland Chamber of Commerce, which received a $20,000 “platinum sponsorship” from PATH that was charged to ratepayers’ electric bills. The Challenge also details generous payments to former state regulators and prominent local businessmen along PATH’s proposed route in exchange for their support of the project, as well as over $100,000 spent on public opinion surveys and focus groups. “This Challenge is not about the contemptible acts which PATH performed as they were trying to get approvals for their project. This Challenge is about who should pay for those acts. The electric bill which my family works to pay every month should not include these charges, and neither should yours,” said Haverty. The PATH Companies have 20 days from the filing date to produce their answer to the Commission. Exhibits to the Formal Challenge can be found here. The Potomac-Appalachian Transmission Highline (PATH) project originally was to run 275 miles from the John Amos coal-fired generation plant in St. Albans, WV, to a new 42-acre substation in Frederick County, Md., passing through Loudoun and Frederick counties in Virginia. After more than two years and multiple hearings in three states, the project was “suspended” in 2011 by regional grid operator PJM Interconnection after opponents demonstrated it was not needed. The utility companies then withdrew their applications before state regulatory agencies. Despite PATH's suspension, AEP and FirstEnergy are allowed to recover project costs, collected since 2008 from the 54 million ratepayers in the PJM region – all or parts of Delaware, Illinois, Indiana, Kentucky, Maryland, Michigan, New Jersey, North Carolina, Ohio, Pennsylvania, Tennessee, Virginia, West Virginia and the District of Columbia. This cost recovery will continue at a level “necessary to maintain the project in its current state” until the project is officially abandoned at FERC. PATH also was guaranteed the right to apply for 100% recovery of abandoned project costs as part of an incentives package they were granted by FERC in 2008. A copy of the recent complaint and related filings can be viewed on FERC dockets ER08-386 and ER12-269. Breaking News: PJM urges power companies to "suspend efforts" on PATH project! Yesterday's announcement by PJM directing AEP/FirstEnergy to suspend efforts on the Potomac-Appalachian Transmission Highline is a major victory and vindication for the thousands of landowners and ratepayers who have been fighting a David vs. Goliath battle with the corporations and government for nearly three years. We are pleased at the subsequent requests by the companies to withdraw their permit applications in West Virginia, Virginia and Maryland. Our opposition has always been based on our determination that the PATH project is not needed. Instead, the project was motivated by Federal Energy Regulatory Commission (FERC) incentives, including recovery of all project costs and a 14.3% return on equity. The claims of need for the project have shifted so far out into the future that it has put the project "on hold" for now. We call on PJM to be forthcoming and promptly release results of new analyses and forecasts for the PJM region. It is unacceptable that PJM's and PATH's unwillingness to accept the changing landscape for energy policy could continue to hold landowners in three states hostage while they continue to entertain an unneeded project endlessly. While we celebrate this victory, we also realize that this battle is not over. PJM Interconnection will be conducting what it calls "more rigorous analysis of the potential need for PATH." AEP's CEO Michael Morris told the Energy Business Review, "We remain convinced that the project will be needed and plan to move forward with it when PJM completes its review." We are surprised that Mr. Morris would say this when it has been proven there is no need and the project has no terminus. We also note that the suspension of this project in lieu of abandonment ensures the PATH companies will continue to spend ratepayer money to maintain the project. They will continue to hold real estate purchased and collect a 14.3% return on equity from electric ratepayers through their FERC Formula Rate for a project that has no projected in-service date and for which the companies are no longer seeking permits. We ask that the project be properly abandoned now, and if a need for PATH or a similar project materializes in the distant future, the companies reapply for FERC incentives at that time. Jeri Matheney, a spokeswoman for AEP said the utilities also would suspend efforts to purchase land for the right of way, however she failed to acknowledge that funds recovered from ratepayers have financed this project to date and will continue to do so under their current scheme of holding of the project in abeyance indefinitely. The Formal Challenge to PATH's 2010 Formula Rate Annual Update detailing PATH's over recovery of more than $3M from ratepayers in thirteen states and the District of Columbia in 2009 remains open before FERC. Complainants Keryn Newman and Alison Haverty plan to continue pursuit of the refund due to ratepayers. StopPATHWV, Inc. thanks our intervenors, volunteers, financial supporters and friends for their participation over the past 2 1/2 years. We urge everyone to remain vigilant as we continue our fight against corporate greed. We plan to continue, and expand, our efforts and welcome your involvement. In addition, we will be continuing our efforts to ensure West Virginia's and the region's needs for reliable power are met through rebuilding of aging high voltage transmission infrastructure through our involvement with the Coalition for Reliable Power. We've come too far and learned too much -- the fight is not over! There is now a clear alternative to PATH! Dominion's PATH Alternative One, reinforced by the WV PSC approval of the Mt. Storm-Doubs rebuild changed everything. We now have a simple, economic plan for re-building existing transmission lines to provide increased capacity and the infrastructure we need to provide the citizens of West Virginia with safe, reliable electricity without building new transmission lines like PATH! Rebuilding takes no new land from West Virginia landowners. Rebuilding costs less than 1/3 the cost of PATH. Rebuilding can be completed faster than PATH and is the best solution to West Virginia's aging transmission grid. 1. What lines should be rebuilt? Dominion's Alternative One says Mt. Storm to Doubs (already approved by PJM and WV PSC and can be done by 2015) and Pruntytown to Mt. Storm (which is owned by Allegheny, one of the PATH owners). Allegheny will probably resist its responsibility to fix its power line, so the WV PSC must pressure Allegheny to do it. 2. Why can the rebuilds be done faster? Because they are essentially repairs of existing 500 kV lines and require no new rights-of-way across private or federal land so the permitting process is much less involved than PATH's. The WV PSC approved the Mt. Storm-Doubs rebuild only two days after their engineers gave the project their support. 3. What are the cost estimates? Dominion estimated Alternative One's cost at $620 million. Even with construction overruns, it probably won't be more than $800 million. AEP/Allegheny claim PATH will cost $2.1 billion, but PJM has a different cost estimating method that shows PATH's projected cost may actually be $3.22 billion. With cost overruns in actual construction, PATH's cost could be up to $4 billion, more than four times the cost of even the higher estimate for Alternative One. 4. How do both alternatives compare in terms of land needs? Current rough estimates say that PATH would take about 7000 acres of NEW rights-of-way, most of it productive timber and farm land which could no longer be used productively for that purpose. Alternative One, because it rebuilds only existing power lines, requires NO new land for rights-of-way, except for a few temporary access roads for construction. We know from the TrAIL project that AEP/Allegheny will probably use Kenny Construction from Illinois for PATH's construction and Supreme Industries from Connecticut to clear land. Both companies bring their own specialized workers and hire few West Virginians. Dominion has already said that its rebuilding of Mt. Storm to Doubs can be done with a lot of their own workers and local companies. This is quite likely also true of Allegheny's rebuild of Pruntytown to Mt. Storm. Therefore, rebuilding will probably mean more jobs for WV than PATH. 6. Will the rebuilding be as good as PATH at fixing the problems PJM has identified? Rebuilding will fix all but a few of PJM's problems. Those problems would appear only at the end of PJM's 15-year planning period, so there is lots of time to fix them individually, and, with the cost savings from the rebuild, there is lots of money to fix these few problems, if they appear. 7. Will WV ratepayers still pay for the rebuild? Yes, it is likely that FERC and PJM will still make us pay for the rebuild project, but its cost will only be 20 to 30 percent of PATH's cost. Like PATH, the cost of the rebuild will be spread over all ratepayers in PJM, not just those in WV. Two West Virginia citizens have filed a formal complaint with the Federal Energy Regulatory Commission alleging that the PATH Company subsidiaries of Allegheny Energy and American Electric Power have wrongly charged over $3 million in improper expenditures to electric ratepayers in 13 states and the District of Columbia. In their Formal Challenge to the Potomac-Appalachian Transmission Highline, LLC 2010 Formula Rate Annual Update, filed Friday with the Commission, Keryn Newman of Shepherdstown and Alison Haverty of Chloe say their review of 2009 project costs revealed a pattern of misleading marketing efforts using funds inappropriately charged to ratepayers and a range of accounting errors. The complaint asks that the FERC not accept PATH’s Annual Update and begin a broader investigation. Newman and Haverty allege that the PATH Companies wrongly recovered expenses for a $2 million advertising campaign and over $1 million for creation and management of front groups and a propaganda program carried out with private groups and inappropriately billed as “public education.” The women describe improper lobbying and charitable donations, and actions to suppress citizen opposition in Loudoun County, Va.
“This Challenge tells the story of PATH’s public relations war against the customers they are supposed to serve, as revealed to us by the money they spent -- our money,” said Newman. The 275-mile PATH electric transmission project is currently being considered by state regulatory commissions in West Virginia, Virginia and Maryland. Regional grid operator PJM Interconnection has collected an annual revenue requirement for yearly PATH expenses from PJM’s 51 million ratepayers every year since 2008. "We all see our rates going up, but rarely do we understand why. It is extremely upsetting to know PATH spent almost 20 percent of their collected costs on front groups and advertising for a project they can't get approved. They just asked for another delay in the approval process. It's a nightmare for the thousands of West Virginians whose lives are in limbo. When you see injustice like this, you have to try to do something," said Haverty. Bill Howley, who writes The Power Line blog that has focused on the PATH project for the last three years, said, "The FERC challenge reveals just how out of control FERC's cost recovery system has become. This rate increase scheme for PATH was created by FERC almost four years ago, and now Dominion Virginia Power's Alternative One has made PATH completely unnecessary. Ali and Keryn are right, and all West Virginia consumers should stand by them in their fight against this crazy system." Newman and Haverty have been examining PATH’s costs since last summer using rules designed to provide public transparency. The two citizens filed a Preliminary Challenge on the PATH Companies last November, which was not answered to their satisfaction. “The burden has now shifted to the PATH Companies to prove the accuracy of their accounting and the prudence of their expenditures,” said Newman. The PATH Companies have 20 days from the filing date to produce their answer to the Commission. How much do PATH's dumb ads cost you? What's the status of PATH? The PATH case was recently tolled for the fourth time at the WV Public Service Commission. This means the case has been delayed again, with a total delay of almost two years so far since their original application was filed in May, 2009. These continual delays result from PATH's "Need" case falling apart again and again, requiring them to ask for delay after delay. As it stands now, the case will resume in the spring, with evidentiary hearings scheduled for October, 2011 and a decision on February 9, 2012. In Virginia, PATH's recent request to toll the case was denied by the VA State Corporation Commission. The Virginia case will proceed on the schedule that has already been set, with public hearings in Winchester and Purcellville on February 2 & 3, and evidentiary hearings in Richmond in April, 2011. 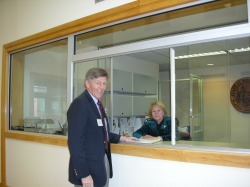 A decision will be rendered in Virginia before September 20, 2011. The Maryland PSC is still contemplating PATH's recent request to toll the case in that state. The current schedule calls for evidentiary hearings to begin in May, 2011. The Maryland case is an unknown at this time. There's deception here somewhere. I can smell it! The deadline for a response to the West Virginia PSC Staff's motion to dismiss the PATH case was Monday, December 20. At the last minute, PATH fell to its knees and begged for another 6-month delay in the case. They followed by issuing a press release claiming that the delays are necessary because PJM has come up with new load forecasts that may change PATH's required in-service date and these new forecasts won't be ready until late-March 2011. Wow! What a coincidence! PJM's numbers changed on the very same day that PATH was forced to ask for a fourth delay of the case in West Virginia because their case for "need" has once again fallen apart. On December 21, they also filed for delays in Virginia and Maryland. The Commissions in all three states will be considering whether to grant PATH's request. It's not looking good for them. Viable, less expensive and less intrusive alternatives to PATH have recently come to light and will be considered, despite PATH's and PJM's attempts to sweep them under the rug. Another delay so that PJM can attempt to remake PATH's case for them is unconscionable and deceptive. It's all up to the three state Commissions now to do the right thing for their citizens. On December 10, the staff of the West Virginia Public Service Commission filed a Motion to Dismiss the Filing as Insufficient or in the Alternative, Require PATH to Request a Tolling and Implement Further Case Processing Procedures. For more see StopPATHWV blog. PATH is once again without an end point. Isn't that how we ended 2009 as well? The Frederick County Board of Zoning Appeals recently turned down PATH's application for a Special Exception to construct their proposed 42-acre substation in an agricultural zone surrounded by over 1300 homes in Mt. Airy, Maryland. PATH can now engage in a lengthy court battle with Frederick County and the Maryland Public Service Commission over siting of the substation, a delay that could take years. If you're looking for information about PATH surveys in Jefferson County currently being conducted by employees of The Louis Berger Group, see this blog post. PATH needs your permission to conduct these surveys and if you have not signed a survey permission form, they are TRESPASSING! Yesterday, the VA SCC issued two orders regarding the PATH application in that state. One order denies the staff's motion to hold the application in abeyance BUT orders that Dominion Virginia Power's rebuild proposal be fully developed in the PATH case. The second order sets a procedural schedule for the case, with hearings in late April, 2011. Read an excellent analysis of the orders at Calhoun Powerline. 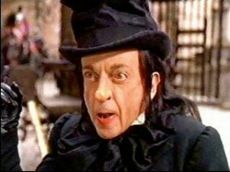 Virginia SCC Staff Deems PATH Application "Incomplete"
I hope you have perfected your "I told you so!" smile, because here's your opportunity to use it! The staff of the Virginia SCC have filed a motion seeking to have PATH's recent application in that state suspended until it is complete. Also, the Maryland Office of People's Counsel cannot agree to the setting of a procedural schedule in that state due to the piecemeal way in which the application was submitted, as well as PATH's failure to provide requested information. No need to reinvent the wheel -- The Power Line has a very good analysis already posted. Please go there for details. PATH Re-files in Virginia - Citizens are Ready! On September 20, PATH finally re-filed in Virginia, after an almost 10 month delay to try to get their act together. The Virginia opposition groups are well-rested and ready to go after them again. See this article. The complete application can be found at the Virginia State Corporation Commission's website or on PATH's website. Did PATH actually follow the instructions for re-filing they were given by the Virginia State Corporation Commission when they were granted dismissal of their original application in January (see articles at the bottom of this page for details)? On September 10, the WV PSC issued an Order granting another toll requested by PATH, which delays the deadline for a commission decision to July 28, 2011. This time, the excuse was that PJM had made a mistake in the base case analysis that the applicants submitted as proof of "need" on July 8. PJM's credibility continues to decline. The PSC ordered the applicants to submit a response detailing the status of the PATH case in Virginia and Maryland, and the applicants submitted a narrative fantasy full of "assume" and "expect" that lacked any solid facts. Fact: There is no application in Virginia at this time. The Maryland application has still not had a procedural schedule set. Despite this, the WV PSC feels confident that the procedural schedules in all three states will be reasonably well-aligned and granted the toll. Practice saying these words with a smile on your face in front of a mirror: "I told you so!". You will have a chance to show off your new skill in the very near future. We have received information that PATH land agents will be back in southern Jefferson County within the next month and will be pushing harder than ever to get property owners to sign purchase option agreements, sell their property and/or sign survey agreements. StopPATH WV will be holding another series of landowner meetings designed to give you the tools and information you need to protect your interests and negotiate effectively with these paid professionals who want to separate you from your property as quickly and cheaply as possible. Find out the truth about other property owners' experiences with transmission line land agents, the code of conduct these agents must follow, get a look at one of PATH's Purchase Option Agreements, find out how your can protect your interests and much, much more. The first meeting will be held on Saturday, August 21st at 2:00 PM at the Chestnut Hill United Methodist Church, 1497 Hostler Road, Harpers Ferry, WV. Parking available behind the church -- meeting will be held on the first floor adjacent to the parking area. The meeting and materials are free and all concerned property owners are encouraged to attend. Additional meetings will be held at other locations in southern Jefferson County in the coming weeks. Watch this website for details or sign up for our email newsletter to receive meeting notices electronically. Allegheny Energy and American Electric Power (with the help of their Ygor, PJM Interconnection), have reanimated their monster! The West Virginia Public Service Commission PATH application process has once again started the clock. PATH submitted new testimony on July 8. They claim that PATH is now needed in June, 2015, according to PJM. Important changes to note in the new testimony include a new estimated cost for PATH of $2.1 Billion and the first two re-routes for the PATH project. These re-routes are in Grant, Tucker and Hampshire Counties and will fall outside PATH's 2,200-ft. 'preferred corridor'. If you are outside PATH's currently identified 2,200-foot wide corridor, take this as the warning it is -- PATH's location can and will change many, many times before it is actually built and could end up anywhere. The good news here is that because of the new landowner notification law the citizens worked so hard to have passed at the legislature early this year, PATH now has to notify landowners via certified mail at least 30 days before the deadline to intervene has passed. Because of delays, filing issues and dismissals of PATH's Virginia and Maryland applications, West Virginia's is now set as the first one of the three state cases to be heard and decided upon. This means we need to put our best foot forward as we proceed, and we're going to need everyone's help along the way. If you haven't already, contact us to sign-up for our email newsletters and action alerts so you will know what to do and when to do it. Right now, we are asking folks to submit their comments regarding the scope of the Environmental Impact Statement that must be completed for PATH. Calhoun Powerline has a good article that explains what you need to do. If you have further questions, feel free to contact us. In Maryland, the PSC seems to have settled the issue of the proper entity to apply for the PATH permit and have accepted PATH's application. The case has not had a procedural schedule set yet, so the clock has not yet begun to run in that state. In Virginia, there is currently no PATH application filed. PATH claims that they will file a new application in the third quarter of 2010. PATH will continue to pursue their plans, no matter how illogical or flimsy they are -- there's a huge profit to be made by these corporations and money is like the carrot on the end of the stick to them. We are also in desperate need of donations to help fund expert witnesses and legal fees necessary to present our case before the PSC. The case is moving now, and we have to pay these professionals for their work. As much as I hate to step onto the 'Hey, buddy, can you spare a dime?' soapbox, we're going to need financial help from as many folks as possible. Please, please seriously consider donating whatever amount you can afford -- see our 'Make a Donation' page for details on how to contribute. There is no one in Jefferson County who can say with certainty, 'PATH won't affect me'. This thing will be visible for miles and will devalue property and lower our tax base, resulting in higher property taxes for everyone. PATH will also increase the amount everyone pays for electric service; pollute groundwater resources due to our Karst topography combined with construction activity and application of herbicides; degrade Harpers Ferry National Park, the Appalachian Trail and the C & O Canal; increase dangerous EMF levels on the exposed population (which will include the staff & students at South Jefferson Elementary School); threaten the Blue Ridge Mountain Volunteer Fire Company location; and subject us to serious environmental consequences. None of PATH's electricity is for us, and for the first time, PJM's future plans show new lines transporting PATH's power to New Jersey. Stop the sacrifice of West Virginia - Stop PATH! After two different delays, the West Virginia Public Service Commission PATH case is set to resume on July 8, 2010 with the applicant's submission of updated need information. If the case stays on schedule, a decision in West Virginia is expected on May 16, 2011. PATH must receive approval from all three states through which it is proposed to pass before the project can proceed. Their application to the Maryland PSC has still not been accepted, and there is no application filed in Virginia, and one is not expected before third quarter 2010. On June 18, in a calculated public relations move, the PATH companies fanned the flames by making some "big announcement" that PJM has determined that PATH will be needed in June 2015. This is not news to those who have been following this case. Calhoun Powerline broke this news on June 10. Past PJM analysis of the need for PATH was thoroughly dissected by grid experts on behalf of the State of Virginia and The Sierra Club and proven false early this year, which resulted in PATH's Virginia application being dismissed. We don't expect that PJM's latest analysis will hold up under closer examination either. Demand for PATH has become even shakier and we have confidence that the regulatory bodies in all three states will make a careful determination of need by weighing all the evidence presented by both sides. The real story here is that dropping demand has pushed even a created need for PATH another year into the future. Join us in exposing the truth about PATH and supporting the opposition through your participation in StopPATH WV events, keeping up-to-date with balanced news reports, and with your greatly appreciated donations toward our expert witness fund. This is our county, this is our land, these are our neighbors, and for some of us, this could be our health and future. Thanks for your support, everyone! 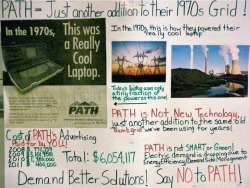 PATH partners American Electric Power and Allegheny Energy have found a new way to waste the ratepayers' money on their PATH marketing campaign. The money to fund this is most likely coming out of your pocket if you're one of the 51 million ratepayers in the PJM region. If PATH's out-of-control spending makes you furious, just think about how the PJM ratepayers in North Carolina, Indiana and Michigan feel about it. Communications counsel & opinion research firm R.L. Repass & Partners, Inc.. has been hired by AEP & Allegheny Energy (see client list on page 6) to "take the pulse" of the public in West Virginia through phone surveys and focus groups. Repass also provides marketing-communications strategy development and strategic and tactical communications for their clients dealing with complex issues and intense media scrutiny. They also offer crisis communication research designed to enhance, protect and restore company reputations and evaluate strategies for improved community support. In short, they're the go-to guys when your company's reputation is in the dumper and you are the most hated and least trusted corporation on the block. For a fee, Repass promises to get into our heads, find out what makes us tick, come up with ways to control our thought process and turn us into the docile, accepting sheep that AEP & Allegheny Energy need to get their unneeded transmission project approved. Citizens have been receiving phone calls from either Repass affiliates Metro Research or McMillion Research, and in some instances even from Repass itself, for phone surveys or invitations to attend focus groups for which you will be paid $100. Of course, you will pay that $100 back in your electric bill, plus a 14.3% FERC incentive, so it's really not at all like winning your own mini-lottery. If you didn't read the R.L. Repass brochure linked above, here's something you should be aware of: Repass offers "remote monitoring of interviews from the client's home or office telephone" while they are doing their survey phone calls through their affiliates. I assume this means without the knowledge of the call recipient. So, be aware that while you're talking to the survey person on the phone, "big brother" at AEP or Allegheny headquarters may be eavesdropping on your conversation. Likewise, if you get invited to one of Repass's focus groups, contact us to find out what we learned at the ones they held last week, methods and messages, and how you will be observed and recorded during the session. Do you feel we need to improve/build more: roads, gas lines, jobs, transmission lines? Is the cost of electricity too high? Should we protect the environment or build new transmission lines for cheaper power? Would we need new transmission lines to bring alternative energy sources like wind & solar to market? Have you heard about any of the following: Long list of items, including TrAIL & PATH. If you indicate that you have heard about PATH, they want to know what you think about it, what you know about the status of the project and what you have heard about it and from whom. Rate your opinion of the following companies: Toyota, coal companies, other major corporations, Appalachian Power, Allegheny Energy and American Electric Power. What is your opinion of The Sierra Club? What is your opinion of West Virginians for Reliable Power, (PATH's phony "grassroots" front group that you're also paying for)? Where do you get your information about PATH? Choose TV, radio, newspapers, friends, public meetings or the internet. What is your opinion of the Public Service Commission? Will new transmission lines lower our electric rates? Is PATH a pipeline to the northeast with no local benefits? What advice do you suppose Repass will give to AEP & Allegheny after the survey is complete? It's entirely up to all of you! On June 3, the WV Public Service Commission granted PATH's motion to toll the case for another 3 months. The new decision date has been set for May 16, 2011. PATH claims that the delay will more closely align the PSC case schedules in the three affected states, but that's the same specious argument they've been using over and over. The application in Maryland has not been accepted yet, and there is no pending application in Virginia. What the delay actually does is give our side more time to review the additional data that PATH will submit on July 8, 2010. This delay was requested of PATH by the PSC staff. Also in this order are rulings on a plethora of other issues; from motions to compel to land agent activity to complaints about dangerous PATH helicopters and PATH marketing schemes. Everyone should read the order. Also see our StopPATHWV blog for additional comments and things you can do and ways you can protect yourself from PATH abuse. To show their appreciation for his faithful efforts toward the passage of West Virginia Senate Bill 614, members of StopPATH WV presented Senator John Unger with a Resolution of Appreciation during their meeting on April 19th. SB 614 provides for greater protection for West Virginia landowners during the siting of high-voltage transmission lines. In the future, applicants for a transmission line will be required to notify landowners within their specified "preferred corridor" that their property is subject to eminent domain taking at least 30 days before the deadline to legally intervene in the case before the Public Service Commission. This will give landowners a voice in the process for approval. As of this late date, there are still property owners who are not aware that PATH is a threat to them, according to a recent filing in the case by the applicants. Senator Unger heard our collective voice and worked with citizens to draft the bill, was instrumental in re-building the bill after it was initially gutted, worked to gain support in the legislature, and finally shepherded the bill through final approvals and signature by the Governor. StopPATH WV President Roger Eitelman presented Unger with this Resolution of Appreciation, signed by 96 citizens from a number of counties across the state. 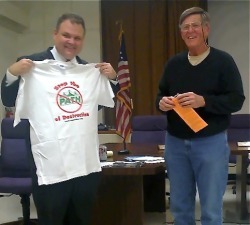 The group also presented Unger with a "Stop the PATH of Destruction" t-shirt and glow-in-the-dark bracelet reading "Oh No! We won't glow! ", referring to the adverse health effects that are expected to be experienced by the exposed population. Senator Unger told the crowd that he wasn't the hero in the passage of the bill, but that the title of hero belongs to all the citizens who have worked so hard on its passage and continue their efforts to halt the PATH project. That the bill passed on the first attempt was called "amazing" by Unger and he credited the constant pressure on the legislature by concerned citizens for its success. "You are giving hope to a lot of people throughout the State that are being trampled on by corporations making a huge profit", said Unger. Unger stated that he represents people, not corporations. "You are an example to others", continued Unger. "Citizens banding together to change their government is what built this country", he said, referring to the Boston Tea Party. Senator Unger closed with encouragement to persevere and stick together while the power companies attempt to wear us down. The landowner notification bill (SB 614) was signed into law by Governor Joe Manchin on April 2. The bill will become effective on June 11, 2010. This important law provides for notification of landowners in the preferred routing corridor of a new transmission line by certified mail no later than 30 days before the period to intervene in the case before the PSC closes. The new law also requires the PSC to consider the best interests of West Virginians when making a decision on a proposed project. While this won't have any effect on the current PATH case, at least property owners affected by future transmission line proposals will have a chance to become involved in and attempt to influence PSC decisions regarding need, effects and routing of new transmission lines. The success of this grassroots effort is due to the tireless efforts of many of the current intervenors in the PATH case, as well as the many concerned citizens who made the effort to let the legislature know their wishes. Together, we can change the world and leave it a better place than we found it! 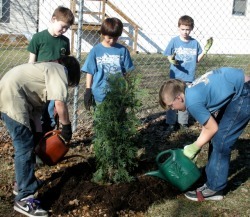 StopPATH WV marked The Sierra Club's National Clean Air Day on March 16 in Summit Point by donating and planting several Arborvitae Green Giant trees at South Jefferson Elementary School, assisted by members of Charles Town Cub Scout Pack 42 and Boy Scout Troops 42 & 33. The trees will provide a screen for a fence on the school's grounds and contribute to clean air efforts in Jefferson County. The Sierra Club's National Clean Air Day supports efforts by the Environmental Protection Agency (EPA) to strengthen safeguards against smog under the Clean Air Act. With a 40-year track record of successfully reducing pollution while allowing economic growth, the Clean Air Act proposal will bring significant reductions in dangerous smog. EPA’s proposal calls for the primary limit for ozone, or smog, to be lowered to between 60 and 70 parts per billion—within the range that doctors and scientists say is protective of human health. The agency is also proposing to lower the secondary limit, which helps to lessen environmental problems like haze. South Jefferson Elementary School is situated less than 1,000 feet from PATH's proposed route in Jefferson County. Thousands of trees could be lost to PATH's proposed new 200 foot cleared right-of-way. 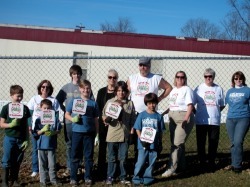 StopPATH WV recognizes the importance of clean air in Jefferson County and the benefits of local community action to protect and preserve our schools and community. We thank the local scouts for their assistance with this effort. Assisting were Samuel Smith, Tommy Carte' and Gavin Megonigal, all Webelos from Charles Town-based Pack 42. Also assisting were Johnny Campbell, Bear Scout from Cub Scout Pack 42, Connor Campbell, Boy Scout from Troop 42, Kelly Campbell from Troop 42 and Jake Newman from Troop 33 in Shepherdstown. Participating from StopPATH WV were Patience Wait, Steven Smith, Sharon Wilson, Keryn Newman and Robin Huyett-Thomas. Steve Smith, Keryn Newman, Patience Wait and Roger Eitelman traveled to Charleston on February 24 to attend the West Virginia Environmental Council's E-Day events. 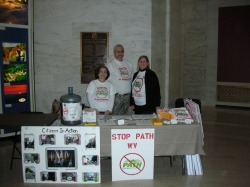 From 9:00 to 3:00, they took turns staffing the StopPATH WV table in the lower rotunda and visiting various legislators. We had lots of visitors at our table and educated both citizens and legislators alike about PATH. In the afternoon, Roger and Steve attended the House Energy, Industry and Labor Committee meeting to witness HB4403, the PSC reform bill, being voted on its way to the Judiciary Committee, who will hopefully send it to the floor of the House. It was thanks to the many citizens who called and emailed legislators that the vote was an overwhelming majority! Please keep up your efforts to get this bill through Judiciary. Together, we can make a difference! Roger and Keryn took a break and drove over to the West Virginia Public Service Commission's office where Roger delivered 2,276 petition signatures opposing PATH to executive secretary Sandra Squires. Although probably none too happy to see us with a huge folder of papers her staff would have to scan and docket, Ms. Squires was very gracious and met us personally and posed for a photo. You can see the petitions on the PSC's online docket by clicking this link. In the evening, we attended the Environmental Council's E-Day Awards Dinner and Banquet. Bill Howley of Calhoun Powerline was honored with the Laura Foreman Grassroots Activist award for his hard work and dedication in educating the public with "the real facts" about PATH. Congratulations, Bill, and thanks from all of us here at StopPATH WV for all you do to bring truth and balance to PATH's propaganda campaign! Yesterday (Jan. 27) the Virginia State Corporation Commission (SCC) dismissed the case in which PATH Allegheny Virginia Transmission Corporation was seeking approval to build the Virginia portion of the proposed PATH high voltage transmission line. The SCC granted PATH’s motion to withdraw its application and terminate the proceeding. The segments in Virginia were part of a high-voltage line planned from the existing Amos substation near St. Albans, West Virginia to a new substation at Kemptown near New Market, Maryland. PJM Interconnection’s Regional Transmission Expansion Plans of 2010 or later and PJM’s 2010 or later Reliability Pricing Model auction. Updated load flow analyses in the form requested for this case (which showed no need for the PATH line in 2014). An analysis of changes in circumstances, including changes in generation, demand response, and energy efficiency resources. The PATH Project’s original routes (including routes that do not impact Virginia) consistent with the information provided regarding other proposed and alternative routes. This is good news - but we can't let our guard down. In newspaper articles today about the dismissal, PATH representatives are saying the application will be resubmitted in the third quarter of this year (July-August-September time frame). This clearly puts the lie to their argument in Maryland that they're trying to get all three states on the same procedural calendar, but it means it's not dead. We owe a great deal of thanks to the dedicated opponents in Virginia, and the expert witnesses for the Sierra Club, Earth Justice, and the SCC staff, who did such great work! Now attention will turn to Maryland, where that state's Public Service Commission has not yet decided if it will accept the OLD "new" PATH application (all the original need arguments, so thoroughly discredited in the Virginia case, wrapped into a new application). The VA State Corporation Commission (SCC) is weighing the recommendation of its hearing examiner in early January to allow PATH to withdraw its application there. Following oral arguments Dec. 30 on PATH's request to withdraw, the hearing examiner attached possible conditions to his recommendation, including a requirement that any new PATH application include the most up-to-date forecasts incorporating demand response programs, energy efficiency, any changes in generation capability (new plants added, old ones closed), and more information on routing decisions. This is noteworthy because PATH was forced to file an amended motion to withdraw in late December; the amended motion included PATH's acknowledgement that PJM (the regional organization that blesses all such projects) has started making new need forecasts based on better information, and has already concluded that PATH will NOT be needed in 2014! Here’s a link to the amended motion, so you can read it for yourselves. What does this mean for PATH in West Virginia? Anyhow, it’s very possible that we’ll know the Virginia SCC’s decision in the next few days. Keep your fingers crossed and your prayers flowing! Copyright 2010 StopPATH WV, Inc.